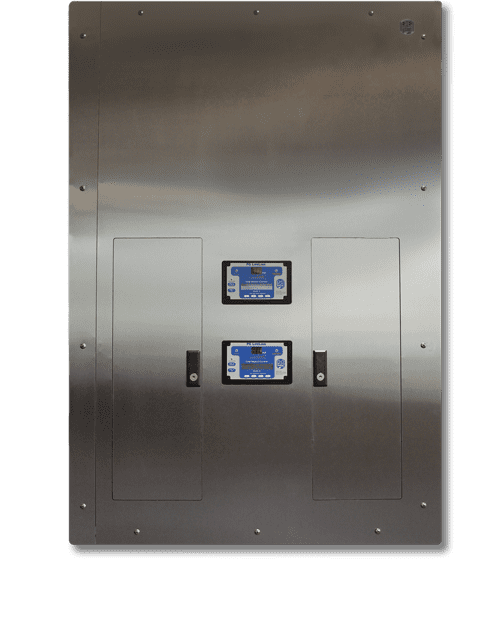 The Enhanced IPX Duplex Isolated Power Supply System contains two separate hospital Isolated Power Systems within one enclosure and includes an industry leading 6” back box depth and a concealed hinged front. The IPX Panel simplifies installation, maximizes available space and provides up to 32 branch circuits to a single room. The dual feed design has an internal separation barrier and is suitable for distributing both normal and emergency circuits from one enclosure. The Enhanced IPX Duplex Isolated Power Panel is typically used in hospital operating rooms and other wet procedure locations with load requirements exceeding 10kVA, or 16 circuits. Any combination of transformer sizes up to 20kVA total capacity can be specified. Secondary voltage output is typically 120V however, higher voltage output on either side is possible. Select above required kVA sizes for each side of system. Special low leakage wire should always be used for the powered conductors of branch circuit wiring. XPLE type insulation such as XHHW-2 wire is recommended with a dielectric constant of less than 3.5. Standard type insulation such as THHN is appropriate for the incoming primary and the ground wires only. The NEC (Article 517.160) requires secondary circuits to be colored brown and orange, with a distinctive stripe in a contrasting color. The brown wire is connected to the L2 bus and the hot side (brass screw) of a standard NEMA receptacle. The orange wire, L1 is connected to the silver screw where neutral would be connected. Polarity should be maintained throughout the installation. Conduit runs for branch circuits should be as short and direct as possible to minimize accumulated leakage current in the circuit conductors. Generally, 400‐450 feet is the maximum recommended cumulative length of for all branch conductors from a single transformer. Avoid unnecessary bends and junctions. Do not use pulling compounds to lubricate inside of conduit. This will break down the insulation properties and raise leakage current. A dry talc powder may be used. It is typical to use conduit with a slightly larger diameter to ease pulling and avoid damage to wire insulation. An interior coating of PVC may also be used. Isolated power circuits must be kept separate from other circuits. Do not share conduit or raceway with non‐isolated circuits, or isolated circuits from another system. PG LifeLink Isolated Power Panel Seismic Certification document for standard power panels. Certification in progress for enhanced panel line.